Occasionally, I like to write about things that aren't makeup. I've done posts on nature's beauty and inner beauty. This is more about finding your inner beauty and being comfortable in your own skin. It's something I know many girls and women (even men) struggle with. I've long looked at myself and been unhappy with my body, or my uneven skin, who hasn't? I've found something that has made me look at myself in a new light. 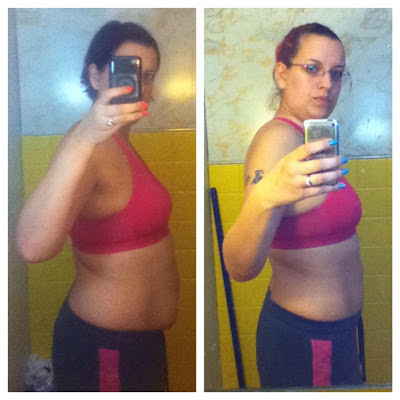 I'm healthier than I've ever been, I'm losing weight, and it's a great stress release. I'm talking about running. I started running in January as part of a New Year's Resolution, you know, one of those things we say we want to do, stick with it for a week or two, then give up because we've set an unrealistic goal for ourselves. My goal was to run a half marathon before the end of the year. Being as we're almost half way through the year, I've realize that I'm not ready for that distance yet (13.1 miles) That doesn't mean that I gave up on running. Except for the 2 months I was too sick to run (if I can't breathe sitting still, running is out of the question. lol) I've ran at least every other day since the first of the year. I went from being unable to run a quarter of a mile to running almost five miles in an hour (with walk breaks and stops to stretch) Overall, I'm super proud of my progress and while I may not be running a half marathon this year (I'm still undecided) I WILL be running one next year and I'm seriously considering the Chicago Marathon next year. I've already run my first 5k and while I didn't do as well as I had hoped and thought that races may not be for me, I've recently become obsessed with signing up for any race I can scrape up the money for. For me, running is a great stress release and way to unwind. What do you do to relax?